Good Maltese films are like buses – you wait for ages for one, then three turn up at the same time… It’s a loose analogy I know, but I must say it has been a good year or so for the industry. Film-making father and son duo Winston and Joe Azzopardi have made waves with their white-knuckle, sea-based thriller The Boat; Peter Sant has given us the fascinating and thought-provoking Baħar Żmien; and now comes Limestone Cowboy, an affecting look at a man whose delusions of becoming Prime Minister of Malta serve as a balm for a horrific childhood trauma. The 2013 Maltese elections are looming. Karist Camilleri (Paul Portelli), long a devoted Labour Party supporter – as was his late father Noel – applies once again to stand as a candidate for the party. The party once more politely but firmly refuses. Angered by this latest rebuff, Karist decides to run as an Independent. Taking on the mantle of the Limestone Cowboy – the protagonist of the adventurous tales told to Karist as a child by his father – he launches his campaign, making outlandish promises such as turning Sliema into Las Vegas, and trading solely with the US (he and Donald Trump would have made great friends!). Egged on unkindly by his ‘friends’, exploited by the shady Tommy Berbera (Paul Cilia) and fending off the embarrassment caused to his son John (Davide Tucci), Karist rides on regardless, falling deeper and deeper into a mental breakdown as he confronts his childhood demons head on. 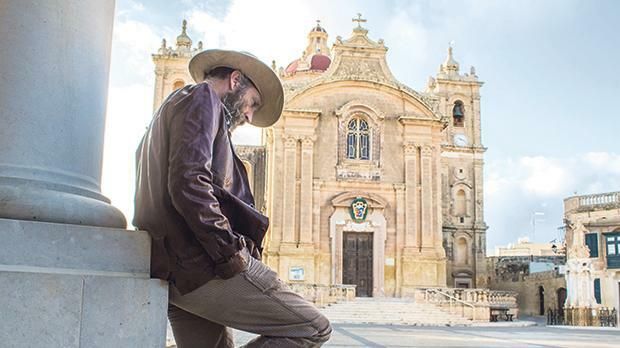 The idea of a story with Maltese politics as a setting may well be off-putting for some, given the current toxic state of the political scene, but fear not – politics merely provide the background to the story – and Limestone Cowboy expertly captures the pre-election mood we are so familiar with. It does not shy away from controversies such as the very ugly side of the dispute between the Malta Labour Party and the Church in the 1960s; or less dramatically, the treatment often meted out to colourful election candidates every four years or so. And overall, the film accurately depicts life in Malta then and now, warts and all, with even the divisive issues of fireworks playing a prominent, and unsurprisingly tragic part. That said, it is in essence a fascinating character study of Karist, a man embarking on a journey towards the edge of the abyss and the most important people in his life – his late father, his wife, his son and grandson; and to a certain extent Tommy, the ‘campaign manager’ who subtly ingratiates himself into Karist’s inner circle. The story also features a coke-trafficking subplot which I initially felt is extraneous; but that too has its place in the overall story. The flashbacks to Karist’s youth, when he was a bubbly, imaginative blond child (played touchingly by Zak Mallia) who worshipped his father (a sympathetic Mark Doneo) are evocative and deeply moving, and set the scene for the man Karist will become. If Carlos Debattista and Jon Mallia’s screenplay, and Abigail Mallia’s direction proficiently set the scene, the script also offers some wonderful characters brought to life by an astonishingly good ensemble. Paul Portelli (disclaimer: he’s a good friend of mine) is indubitably one of Malta’s finest actors. Tall, graceful, soft-spoken, he certainly cuts an impressive figure with his hat, boots and bolo tie. Yet on an emotional level he effortlessly embodies the character’s childlike innocence, immense charisma and inner conflicts. Portelli holds the audience in the palm of his hand as Karist’s poignant story unfolds. Paul Cilia’s Tommy Berbera is a convincing conman, blithely taking advantage of Karist’s innocence. Cilia effectively portrays the many sides to the character – cunning, devious, yet ultimately fallible as devastating news forces him to rethink his methods. Irene Christ is equally effective as Karist’s long-suffering but devoted wife Anya, who looks on lovingly but helplessly as Karist fades away; while fan favourite Tucci easily nails the part of the son who is conflicted between shame and love for his father. The devotion put in to Limestone Cowboy by its makers is obvious. I had seen an earlier cut of the film, and kudos to the team for taking the plunge and cutting off lots of the initial fat to turn in a lean, loving and engaging film, another notch in the belt of Malta’s fledgling film industry.